On March 19, 1969, First Lieutenant Homer R. Steedly Jr. shot and killed a North Vietnamese soldier, Hoang Ngoc Dam, when they met on a jungle trail. In the dead man’s pockets, Homer found a notebook filled with beautiful line drawings, which he sent back to his mother. Thirty-five years later, Homer opened the book and discovered the drawings of the man who had wanted to become a healer. He made a vow to return the book to the dead man’s family if they could be found, and in seeking their forgiveness perhaps find some release from the war that had defined his life. Fellow veteran Wayne Karlin accompanied Homer on his remarkable journey. 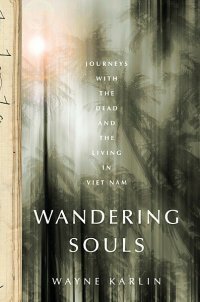 In Wandering Souls, Karlin recounts Homer’s movement toward a recovery that could only come about through a confrontation with the ghosts of his past—and the need of Dam’s family to bring their child’s “wandering soul” to his own peace. Wayne Karlin is an American author, editor, and teacher. In 1998 he was awarded the Paterson Prize in Fiction, and in 2005 he received an Excellence in the Arts Award from the Vietnam Veterans of America.